8-12 crowd.. But hey, I gave you Hunger last post, and I even started this whole blog with The Book of Lost Things. And those are definitely not kid stories! What can I say? I’m a sucker for the stories you want to read out loud to your kids. Your imaginary kids, in my case. Hmm. Let’s move on, shall we? I’ll admit it-I judge a book by its cover. I was charmed by the cute purple plane piloted by children. This is the story of Christina, the daughter of two scientists. Her mother is deceased, dead in an unfortunate laboratory explosion (later we learn that she lives, but is kept captive by an evil scientist to do his scienc-y bidding). Her father, afraid that harm may come to her, keeps her cloistered, in a mansion riddled with secret passages and tunnels. She takes her school lessons on the computer, and can only watch the children at the local orphanage play through her telescope. She’s lonely, and upon hearing a rumor that there is a passageway from her house to the outside, she sets out to discover it. She finds it, of course, and much more: a conspiracy involving Zoom, a stone with powers activated only by sound, orphans, and the powerful man behind Loompski Labs, where her father is head scientist. The situation quickly turns treacherous, and Christina must act quickly and bravely to save herself, her mother, and liberate the ill-used orphans at Happy Orphan House. I think kids will enjoy the book: it has a kid-sized plane powered by a combo of song and thought, mysterious tunnels, and lots of action. As an adult, I resented the “math is too hard for me” bit that Christina falls into, and I longed for a little more character development. I feel like the plot started out strong and interesting, but just didn’t maintain the momentum-it got bogged down in unrealistic adult characters and plot twists that fell flat. Try it out-give it a couple chapters with your family, and if it doesn’t get the thumbs-up, read something by Eva Ibbotson (reviews to come) instead. Jonell, Lynne. 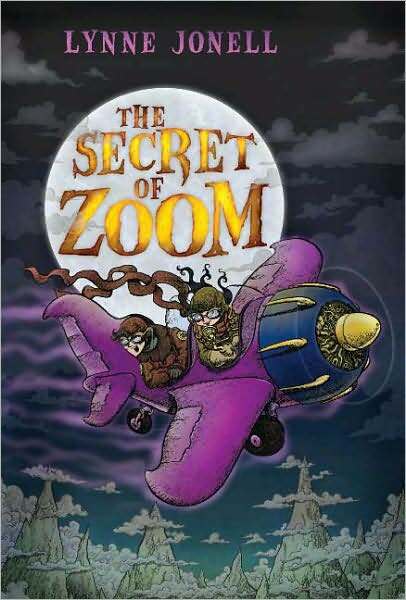 The Secret of Zoom. Henry Holt and Company: New York. (2009). 302 pp. Ages 9-12.